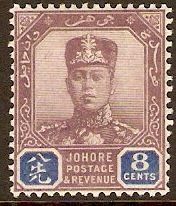 Johore 1884 2c. Pale Rose. SG8. Heavy Mounted Mint 1884 2c. Pale Rose. SG8. Stamp is heavy mounted mint with large tone mark from previous hinge. Johore 1884 2c. Bright Rose. SG15. Mounted Mint 1884 2c. Bright Rose. SG15. 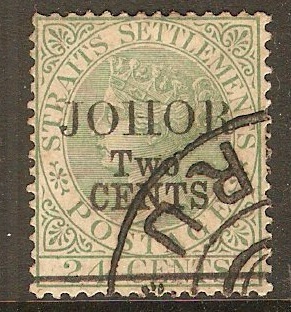 Johore 1891 2c on 24c Green. SG17. Fine used 1891 2c on 24c Green. SG17. Johore 1891 2c. On 24c. Green. SG17. Mounted Mint 1891 2c. On 24c. Green. SG17. 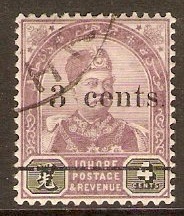 Johore 1891 3c Dull purple and mauve. SG21. Fine used 1891 3c Dull purple and mauve. SG21. 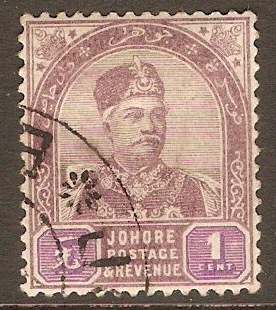 Johore 1891 4c Dull purple and black. SG24. Mounted mint 1891 4c Dull purple and black. SG24. 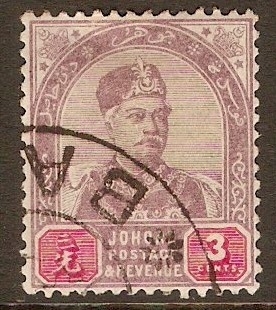 Johore 1891 3c Dull purple and carmine. SG23. Fine used 1891 3c Dull purple and carmine. SG23. Johore 1891 3c. Dull Purple and Carmine. SG23. Mounted Mint 1891 3c. Dull Purple and Carmine. SG23. Johore 1891 5c. Dull Purple and Green. SG25. Mounted Mint 1891 5c. Dull Purple and Green. SG25. 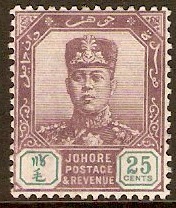 Johore 1894 3c on 4c Dull purple and black. SG28. Fine used 1894 3c on 4c Dull purple and black. SG28.